Mexico is our destination with a Latino styled fiesta where the entertainment is supplied by traditional Mariachi’s. However, the Mariachi’s are presented with a slight twist, as the band is made up of several cheerful-looking skeleton musicians. Developed by Play n Go, Grim Muetro is presented on 5 reels with three rows and features 20 fixed pay lines. The bonus features presented in this vibrant slot game includes scatters, wilds, expanding wilds, a free spin feature, a second chance feature and a top paying jackpot bonus worth 1,000 coins up for the taking. The background takes place at a Mexican Carnival with on cue animations, incredible sound effects and vibrant colours filling the backdrop and reels with a unique fiesta theme. At first glance, it might look a bit strange, but once you take a closer look, you will notice the entire game is filled with floating skulls in a cute and cartoonlike manner. There is a total of four high valued symbols that consist of four skeleton band members dressed up in flamboyant colours including pink, green, blue and orange. The lower valued symbols include 10, J, Q, K and A to complete the set of symbols presented on the reels. 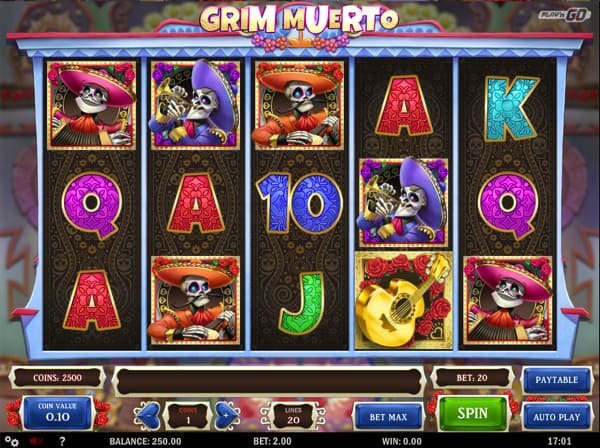 Grim Muerto provides an excellent array of betting options to suit anyone who ventures onto this Mexican-themed video slot. You can choose to bet between 1 and 5 coins per pay line with coin denominations ranging from £0.01 to £1.00. Therefore, the minimum bet you can place on a single spin starts at £0.20 while the maximum you can place on a single spin is £100.00. The gold-plated guitar represents the wild symbol and will gladly stand in for all other standard symbols except the scatter symbol. The book of skulls acts as the scatter symbol and will unlock the free spin feature available in the game. On every spin in the base game, one of the reels will be highlighted. If you manage to display a wild symbol on this reel, it will instantly expand to fill all reel positions, assisting you with greater winning opportunities. The Free Spins round is activated by displaying three book of skulls scatter symbols anywhere in view on reels one, three and five. Once activated, you will be awarded 10 free spins and additional free spins can be re-triggered by displaying three candle symbols during the free spins round. Displaying one or two candle scatter symbols will award you with 3 and 6 extra free spins respectively. The Marco Siniestro feature is also available during the free spins round. However, instead of one reel being highlighted, you will notice between two and five of the reels will be highlighted to increase your chances of claiming an expanding wild symbol. In addition, one of the skeleton musicians will also be selected to act as an extra wild symbol for the duration of the free spins round. Displaying two book of skulls scatter symbols during the base game will activate the second chance feature. You simply have to click on one of the musicians to reveal an instant cash prize. Grim Muerto provides a great selection of extra features coupled with an amusing theme to keep a healthy bankroll. The game has a low to medium variance, providing regular pay outs with a Return to Player ratio set at 96.51%. we have embedded a demo game of Grim Muerto below so that you can try the game for free.